Life isn’t exactly paradise for aspiring artist Morning Glory Conroy. Anxious about an upcoming comics festival and worried about her best friend Julia’s deteriorating home life, Glory has enough to juggle without also being swept off her feet by the guy Julia likes. Gabriel is the answer to every girl’s prayers: sweet, full of wonder at the world, and divinely handsome. But does he count as a real boyfriend if his overbearing guardian forbids even kissing? Not to mention the added complication of his mischievous cousin Luci trailing Glory’s every move just to cause trouble. 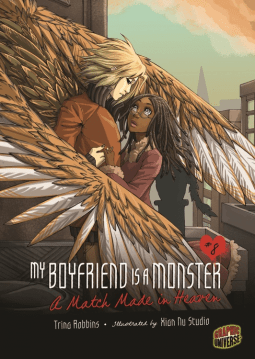 Glory is in for a startling revelation when she discovers Gabriel’s true identity—and learns that their romance has distracted him from an important mission. Will it take a miracle to sort out this mess, or can Glory move heaven and earth to help the people she loves?